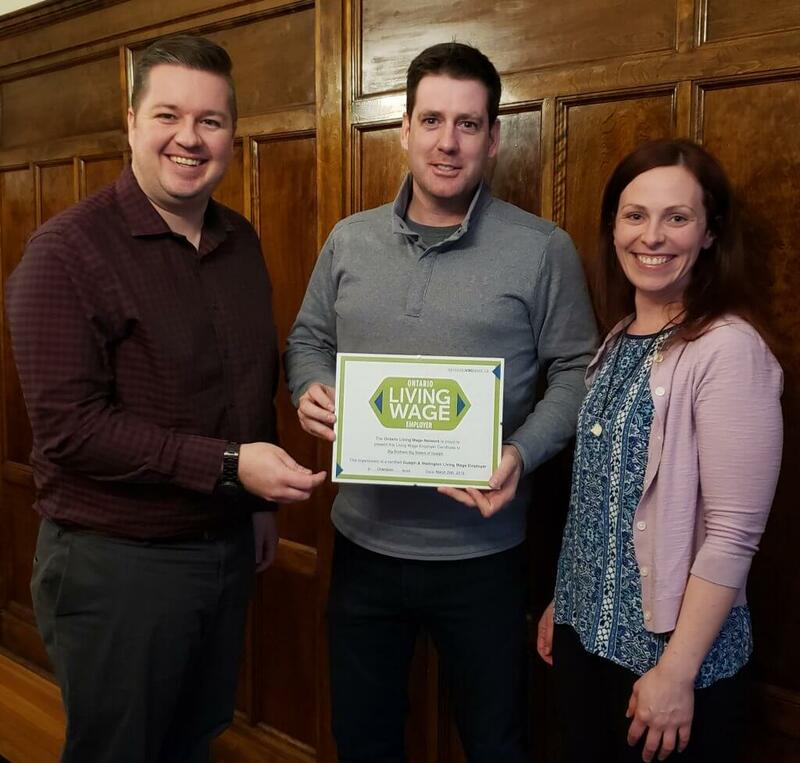 Pictured left to right are BBBSG Executive Director Mike Treadgold, BBBSG Board President Matt Nelson, and Jen Terry, Assistant Coordinator at the Guelph & Wellington Task Force for Poverty Elimination. Big Brothers Big Sisters of Guelph (BBBSG) has been recognized and certified as a Living Wage Employer, making a commitment to support its staff above the city’s assessed minimum compensation deemed necessary to cover a family’s basic expenses and participate in their community. The certification program, facilitated by the Guelph & Wellington Task Force for Poverty Elimination in conjunction with the Ontario Living Wage Network, requires employers to make an annual commitment to guarantee that staff compensation meets or exceeds the prescribed living wage rate, which is calculated based on regular monthly expenses incurred by a family of four with two (full-time) working adults and two children. In November 2018, the living wage in Guelph-Wellington was increased by $0.40 from its previous hourly rate to $16.90/hour. Statistics Canada, various provincial ministries and other local organizations contribute data to help determine a city’s necessary living wage. The city’s largest youth mentoring organization believes that by investing in its staff and making an ongoing commitment towards supporting their individual well-being, workplace culture will be enhanced, and the quality of services and programs offered to local youth in need will remain consistent and impactful. Certified organizations are recognized in one of three categories: Supporter, Leader or Champion. Big Brothers Big Sisters of Guelph has been recognized as a “Champion,” having all full-time and part-time employees earning a living wage, as well as externally contracted employees that provide services on a regular basis. 33 other local employers have already signed on to the program, supporting more than 2,500 employees. The Ontario Living Wage Network asserts that the benefits of paying a living wage include increased employee productivity, morale and loyalty; increased retention and reduced turnover costs; reduced absenteeism and medical costs; increased positive brand association, and expanded economic activity. Big Brothers Big Sisters of Guelph is the city’s largest youth mentoring charity, providing more than 700 at-risk youth with a role model, a mentor and a friend. Established in 1967, the charity facilitates both one-on-one and group-based mentoring programs, serving the communities and schools of Guelph, Aberfoyle, Rockwood, Morriston and Puslinch.